How do I get rid of "earliest wake time"? What I'm asking for is simple. To have f.lux follow the sun. Orange when the sun is down, white while the sun is up. This is how the software used to work for years and why I've been using it for years. I don't want an overly complicated alarm clock. 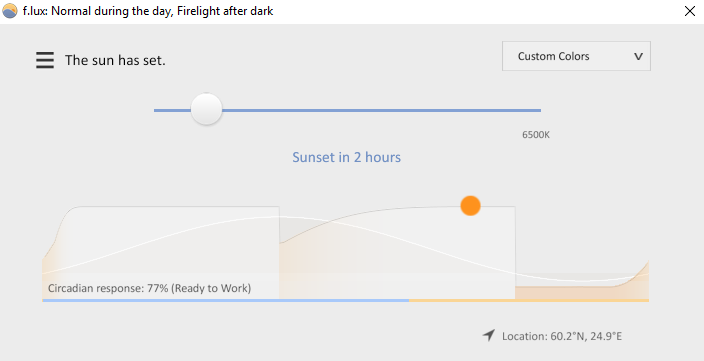 I just want a software that adjusts the light according to the sun's movement. If you want to add a crappy sleep cycle feature to it, go for it, but at least leave us a setting to disable it. I remember there being a "far from equator" option somewhere in the settings in an older version, but that's gone too. Not sure what it would've done, since I just want f.lux to follow the sun like it used to by default, but it's gone regardless. Doing that gives me this mess. Welcome to the far northern hemisphere. Basically, the equation Flux uses breaks down at higher longitudes during the summer as we don't actually have a proper night, as it is split by how far under the horizon the sun actually is from right after it dips under the horizon (Civil Twilight) all the way to Astronomical Twilight at 18 degrees, the point it gets pitch black. In Helsinki the last Astronomical Twilight was May 12th. The workaround is to move your location further south. @johnedwa I understand that, but what's with the sudden drop even though I have the 60 minute slow change enabled? Or the weird dip during the day? Are those simply the result of the whole thing "breaking down" like you said?